Today at AGBT is light on the science talks; the afternoon is free for lazing around the resort complex -- or for swimming laps in the lazy river (which makes it a not-so-lazy-river). I can only manage downstream; upstream is an aquatic treadmill. A key task on Day 1 is to pick up one's registration materials. At one conference I failed to do this promptly and discovered to my dismay that the desk wasn't open during the opening reception slash poster session -- so despite being a speaker I had to sneak into the room via a side door! Registering means picking one's meal pass -- I took the temporary tattoo over the wristband option -- and grabbing the vaunted AGBT backpack. The backpack itself this year looks solid; my 2014 edition is just starting to wear in an alarming way. Made by elleven, it features a padded computer compartment which also has a laptop sleeve, a spacious main compartment with one internal open pocket and a smaller zippered pocket, and then five additional small compartments (I think I've counted them all). There's also a mesh water bottle holster. The straps are nicely padded. Sponsorship for the bag is by Twist Bioscience, who also has some goodies inside, including a hefty notebook with pen and another little bag to touch on below. Well-padded shoulder straps should make this comfortable to carry, even when absurdly loaded (which I tend to do). Only a subset of vendors sponsor goodies or leaflets in the bag. Since everyone gets it and opens it, it's a good way to get your name front-and-center. Many of the brands are very familiar, but there were some new ones. 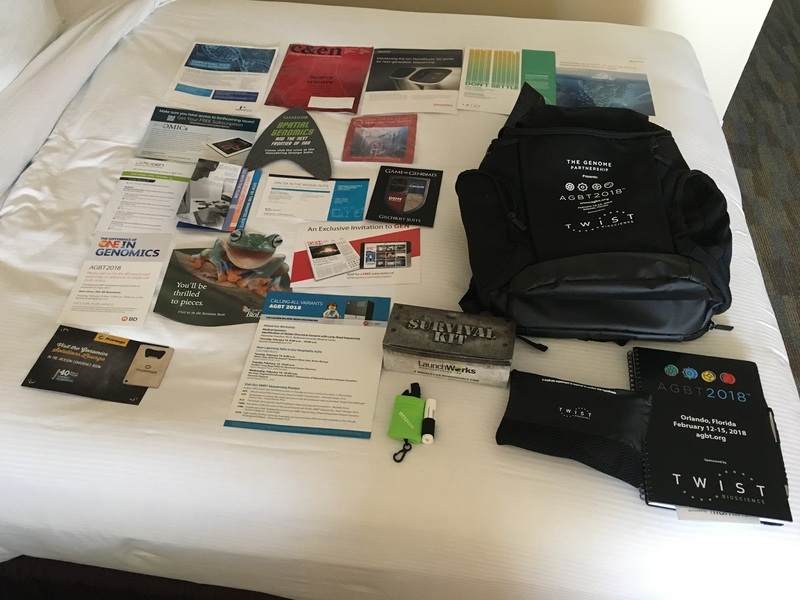 AGBT has a reputation for imbibing and feasting, which also leads to freebies to address the side effects of these practices. A company called LaunchWorks has sponsored a box which covers this and more. LaunchWorks is a contract manufacturer of research-only and diagnostic kits, an outsourcing option that allows clever people to create new molecular biology approaches without building all the infrastructure to package and ship those approaches in kit form. LaunchWorks's box provides a handy guide to the contentx and how to use them, There's sunglasses in case you meet brilliant people, a microfiber lens cloth to keep your vision clear, sun screen M&M candies for sustenance, lip balm and a pen. Not listed on the inventory are single use packets of antacid and aspirin. BTW, first parent or child to ask me for the shades gets them -- everyone in my family is saddled with spectacles. Several of the items in the LaunchWorks kit are repeated by other vendors, though unfortunately they are the sole source for sunscreen. Twist seems to be the only other pen in the bag, and they also provide a little nylon mesh bag with two packets each of ibuprofen and antacid, plus an eyeshade (thankfully blank) and earplugs -- hopefully intended for sleeping through the plane ride home and not through a Twist competitor's talk! Nanostring supplies another microfiber cloth in its own little clip-on carrying bag, which also has a lip balm onboard. The only other non-printed item in the bag is a hefty metal bottle opener from Promega. Well, there is another microfiber cloth, emblazoned with a promo for a new Cold Spring Harbor precision medicine journal called Molecular Case Studies. Also on the publications front: a free copy of Chemical and Engineering News (Jan 15th edition) and enticements for free subscriptions to GEN (Genetic Engineering & Biotechnology News) and Clinical Omics. I'll pass; the piling up of existing free issues is sometimes a source of domestic stress. A schedule of "Game of Genomes" events is a rare item sponsored by multiple companies -- D-Mark Biosciences, Covaris, DDN Storage and Lucigen. That has a schedule of daily events, most of which involve either beer or wine. Well, there is also a conference-wide passport, which if I get stamped at different vendors booths qualifies me for some giveaway. More giveaways? Promega will be giving an Amazon Echo each night; wonder if Alexa will recommend Promega enzymes to all your molecular biology questions. New England Biolabs is promising a limited edition NEB Next t-shirt and a raffle for an Apple watch. Lexogen is sponsoring a slam dunk context -- their protocol for monitoring mRNA dynamics is called SLAM. Great, my worst sport -- no shot at winning the portable speaker. They are also giving out a t-shirt. About that imbibing. I've mentioned above the Game of Genomes (but remember, the television program demonstrates biosample collection methods which will not be sanctioned by your local IRB). There's special NEB Ultra II cocktails on Tuesday night. Do archeal polymerases add some zip that Taq wouldn't? 10X Genomics has a smoothie bar in the mornings -- and afternoon cocktails. Roche's brochure -- a complex folding affair -- includes 3D glasses. Ion Torrent has the only brochure that isn't at all customized for AGBT -- provides lots of stats, but no pointers to sessions or booths or goodies. Other companies with inserts include Twist, Nanostring (with one of only two non-rectangular printed inserts -- NEB has the other one) , Perkin Elmer, PacBio, and Illumina. This is of course an incomplete inventory of vendors at the conference -- between my mailbox and Twitter there must be a dozen more that have exhibits and/or suites. And there will be more giveaways at those and unadvertised ones even at vendors mentioned above. For example, I know PacBio has a drawing for a Women in Science Lego kit, but that isn't listed on the brochure.